The County of Los Angeles is seeking public input on its recently released Vision Zero Action Plan. The plan is a joint product of the County’s Public Health and Public Works Departments. Vision Zero, as many Streetsblog readers know, is traffic street strategy that seeks to prevent all traffic deaths. Vision Zero began in Sweden and spread to places all over the world. 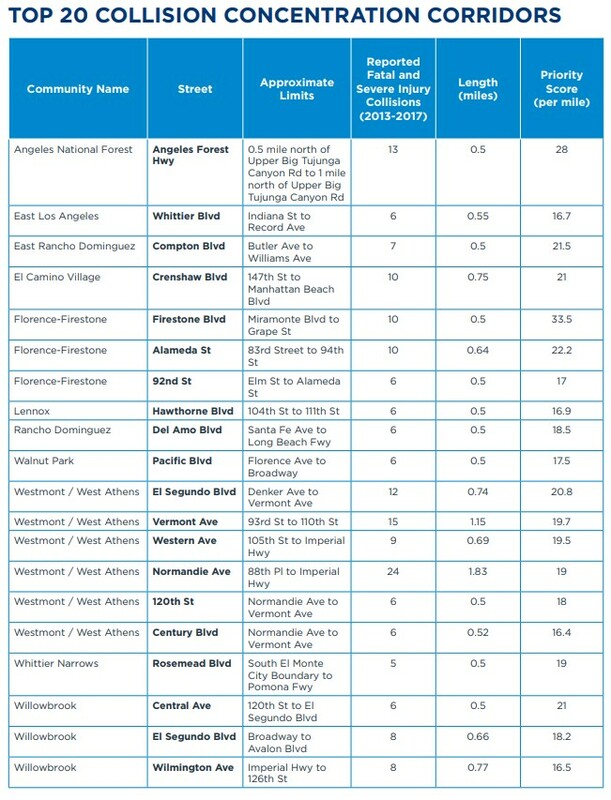 Vision Zero policies have been adopted by numerous municipalities around the U.S., including the city of Los Angeles. County Vision Zero efforts grew out of a 2017 motion by Supervisor Hilda Solis. 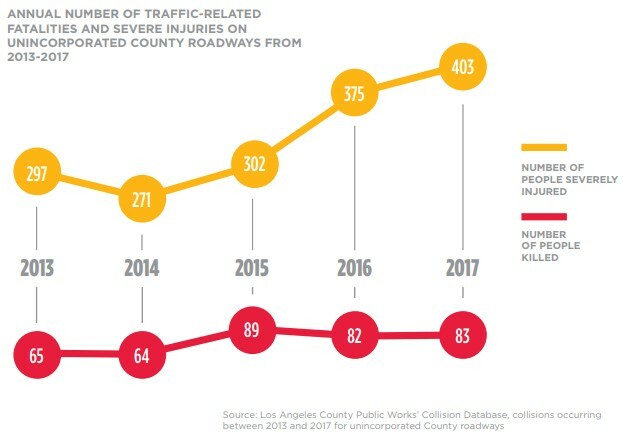 L.A. County’s Vision Zero goal is to eliminate all traffic-related fatalities on unincorporated county roadways by 2035. The action plan focuses on what the county will implement over the next five years. The bulk of the plan applies to unincorporated county areas – places where there is no local city so the county serves as the municipal transportation department. Between 2013 and 2017, 383 people lost their lives to traffic crashes. Each year, drivers kill more than 80 people and severely injure more than 500 people on county roadways. Traffic death and serious injury victims are disproportionately vulnerable road users – including pedestrians, cyclists, and motorcyclists. Though there are deadly streets from Antelope Valley to the South Bay to the Pomona Valley, traffic deaths and injuries are more prevalent in lower-income communities of color, especially South L.A. and Southeast L.A. 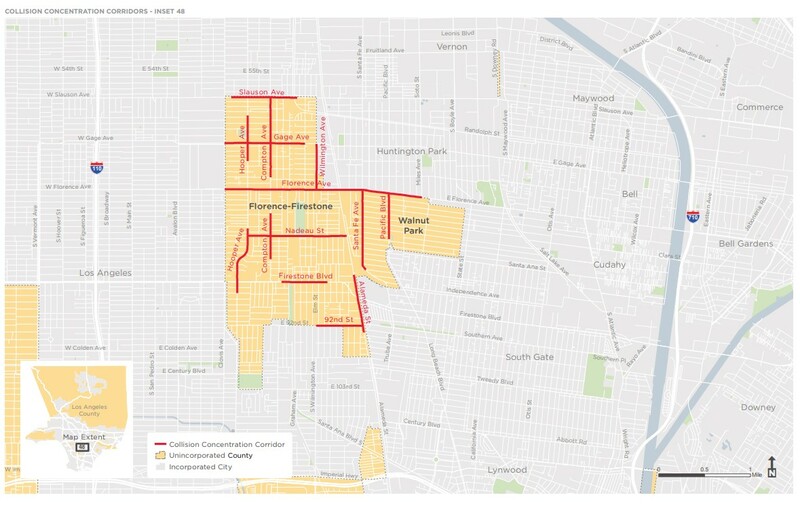 Similar to L.A. City’s High Injury Network, the county has identified “Collision Concentration Corridors” – county roads with high volumes of crashes, injuries, and deaths. 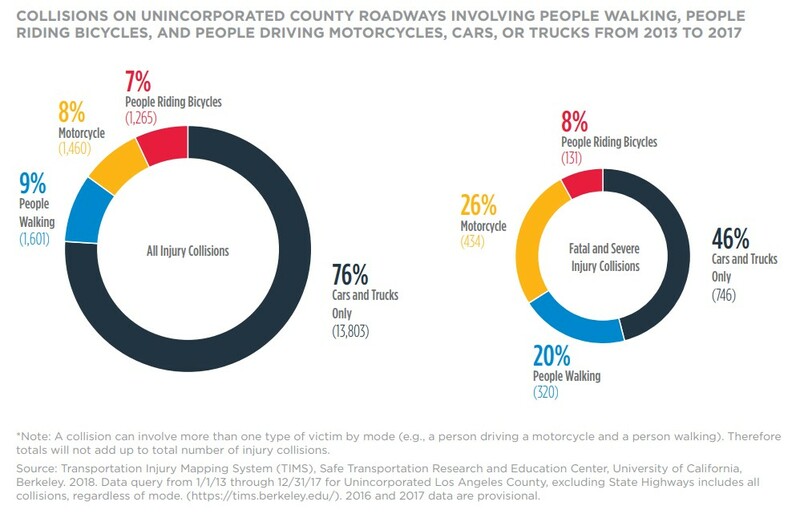 Per the plan, “Fifty percent of fatal and severe injury collisions occurred on approximately 125 miles of roadways – about 3.7 percent of the roadways maintained by the County.” The county classifies these corridors as any half-mile street segment where three or more fatal or severe injury collisions took place between 2013 and 2017. The county crunched data to identify 20 top priority corridors for safety improvements. The plan then identifies various safety improvements that the county will install over the next five years: 20 high-visibility crosswalks, 10 pedestrian head-start signals, one scramble diagonal crossing, etc. Up front, there is a lot of wiggle-language stating that improvements are contingent on funding, resources, community support, etc. Find the full draft plan document at the county’s Vision Zero webpage. Comments can be submitted online or by emailing VisionZero [at] pw.lacounty.gov The deadline for comments is March 31, 2019. Great that the County is getting on this, but in order to see it…you need to fix your links! Thanks for the note – I checked the links and they work fine for me. It appears that both dpw and pw work. The city of L.A. Vision Zero program has a new interactive map which shows traffic fatalities and safety projects.